Use dry ice to carbonate fruit. The fruit will be filled with tingly carbon dioxide bubbles, like a soda. The fizzy fruit is great to eat on its own or it can be used in recipes. You only need two ingredients for this project: dry ice and fruit. Make sure to use food grade dry ice. There is another kind of commercial dry ice, not intended for use around food or consumption, which may contain icky-tasting and potentially unhealthy impurities. Food grade dry ice is solid carbon dioxide, minus the nastiness. Technically, you can use any fruit for this recipe, but there are some that work better than others. Apples, grapes, oranges and other citrus fruit, and bananas work great. Some people dislike the effect carbonation has on the flavor of strawberries. You may wish to experiment to suit your taste. A plastic bowl is recommended because it isn't likely to get cold enough to handle. There is a small risk of getting frostbite handling the base of a glass or metal bowl filled with dry ice with bare hands. Of course, if you wear gloves or use care, it's not a big concern. You want the dry ice to be in relatively small chunks. If your dry ice came as pellets or chips, you're in good shape. Otherwise you will need to smash your dry ice. Do this by placing the dry ice in a paper bag or by covering it with a dishcloth and whacking it (gently) with a hammer. You want to break it into pieces, not pulverize it. Dry ice vigorously sublimes into carbon dioxide gas. As this happens, the gas is pushed into the fruit. Thinner slices or pieces of fruit will become more saturated with carbon dioxide bubbles than larger pieces of fruit. You can use whole grapes or strawberries, but be sure to slice or chunk larger fruits, such as apples or bananas. Slicing grapes or strawberries in half opens them up and helps them get more fizzy. Place some dry ice pellets in a bowl. Set the fruit on the dry ice. You can add more dry ice if you wish. If you like to play with my food, you can stir the mixture, but it's not really necessary. If you want the fruit to get fizzy, but not freeze, place a small cutting board over the dry ice and set the fruit on top of the cutting board. The board should offer enough thermal insulation to protect the fruit. Allow time for the dry ice to sublime (at least 10 minutes). The fruit will freeze and become carbonated. Eat the fizzy fruit, using it in recipes or add it to drinks (makes interesting ice cubes). The fruit will remain fizzy as it thaws, but it should be used (frozen or thawed) within an hour or so because it will lose its bubbles. There are videos that show people carbonating fruit by sealing dry ice and fruit in a plastic bottle. This is not a particularly safe plan, since overpressuring the bottle will cause it to explode. If you decide to try this method, make sure your bottle is plastic (less shrapnel in the event of an explosion) and use a minimal amount of dry ice. I do not recommend this procedure. You can get fizzy fruit without risking a trip to the emergency room. This goes along with the first point: don't seal dry ice into a closed container. Dry ice is very cold, so don't handle it or eat it. Freshly frozen fizzy fruit is the same temperature as dry ice (around -109°F) so allow it to warm a bit before consuming it. 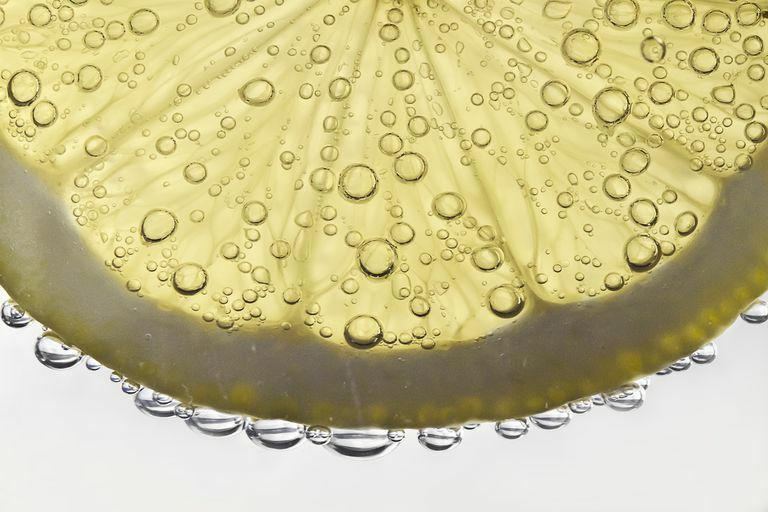 Carbon dioxide bubbles, whether they be in soda, beer, or fizzy fruit, trigger a minor pain response in the nerves of the mouth and tongue. This actually enhances flavor and is one reason why carbonated food and drink is (ironically) pleasurable. Carbonation also affects the flavor of food directly by changing it's pH. It makes food more acidic. Whether or not this improves flavor depends on the composition of the product. The pH change can also change the color of fruit. Deeply-colored fruits are often natural pH indicators. Slice strawberries, sugar them, and add a bit of water to make a syrup. Stir dry ice into the mixture to carbonate the berries and syrup. Use the carbonated strawberries as a topping for strawberry shortcake or ice cream. Slice apples and strawberries. Carbonate them with dry ice. Add them to champagne. Slice a banana. Make it fizzy then coat it with chocolate. Allow the banana to warm slightly before eating it. If you have leftover dry ice, another fun fizzy recipe to try is dry ice ice cream.